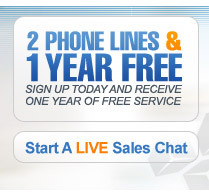 Summary: Get 2 lines and then get 1 free year of service included. This is a promotion that won't last long to take advantage while you can. ViaTalk provides the most cost effective, complete broadband phone service package available to United States residential and business customers. Our unparalleled 24/7 technical support team coupled with our state of the art fiber optic network ensures you that you will have the highest available quality of service.